Looking For Holiday Gifts Ideas? Painted Ponies, Montana Silversmiths, Breyer Horses and accessories, books, sculptures, Leanin’ Tree cards and gifts, winter footwear, breeches, helmet covers and much more. *ALL SADDLES 10% OFF (OR MORE AS TAGGED) *No discounts on Royal Wire products, dewormers, or services. No other discounts apply. SEE US AT THE NOVI EQUESTRIAN EXPO! Interest Rates as low as 3.9%! 2015 Lakota Charger C39 (7309S) Full Living Quarter with Slide-Out! 3 horse, 6’9” wide, 9’ short wall. Stock# J5731TR MSRP: $44,612 Our Price: $38,280 New! SADDLE UP! MAGAZINE Published by C & C Publishing, Inc.
BEAUTIFUL HOMES WITH STUNNING PROPERTIES FOR YOU TO “FALL” INTO! New! $335k - 8 Ac, Pole Barn, 2 Ponds Reduced! FALL WORKSHOPS Coming To Maple Ridge Farm, Holly, Michigan • Would you like to help your horse feel and perform better? • Would you like to deepen your bond with your horse? • Are you interested in learning safe, effective, natural methods of healing yourself and others? Reiki I & II Training December 13-14, 2014 (9:30 - 5:30) • Gentle, hands-on method of promoting natural relaxation • Reduces stress and tension • Promotes body's healing capacity • Safe for people and animals of all ages • Easy to learn and do! Tuition for each class is $250. Pre-registration is required. Class size is limited. Cowgirl’s Boutique The Most Unique Western Store In The Midwest! your own horse or one of ours! Brighton Road, Brighton, MI - 10 rolling, wooded acres. 4700 sq. ft. of total living space w/1200 sq. ft. in walkout lower level. 4 bedrooms, 3 baths, 2 lavs., and spa room with sauna. 40x24 horse barn, 2nd barn with mechanics pit. Personal cabin in the woods, plus you can ride to state land! Offered at $640,000. Challis Road, Brighton, MI - Built in 1986. Gorgeous 10.75 acres. 2900 sq. ft. home with 3 bedrooms, 2.1 baths and a built in pool for those hot summers. Fenced pastures, outdoor riding arena, 5 stall barn with tack room. Offered at $495,000. Mark your calendars for our 2015 Tack Sale @ East Rockford Middle School March 21st! 16’ Calico Stock Trailer sale! CM 3 Horse All Aluminum Slant Load sale! 16’ All Aluminum Stock Trailer sale! DR TRAILER SALES - THE BEST DEALS IN TOWN! 20’ Gooseneck 12,000 GVWR sale! All Aluminum 16’ 10,000 GVWR sale! Corn Pro 16’ Stock Trailer sale! (734) 439-1441 (734) 255-8539 Call us for your BEST Deal! 60’ Round Pen with Walk Thru Gate sale! 1-16’x11’ sliding door 1-3’-0”x6’-8” walk door Trusses 4’ O.C. 1-20’x14’ sliding door 1-3’-0”x6’-8” walk door Trusses 4’ O.C. 1-20’x12’-8” sliding door 1-24’x14’ sliding door 1-3’-0”x6’-8” walk door Trusses 4’ O.C. 1-20’x12’-6” sliding door 1-24’x14’ sliding door 1-3’-0”x6’-8” walk door Trusses 4’ O.C. Call for all your building needs! 45 Acres, Secluded & Horse Ready! Gorgeous horse farm 21 miles North of Lapeer, MI. Three barns: one with 8 stalls, tack room with shower, on demand water heater, furnace, galvanized grain bin, climate controlled hay loft. Fenced pastures, two run-ins. 10 acres of woods, 35 acres of pasture, hay and house. 2200 sq. ft. 3 bedroom, 3 bath log and stone home with country porches. Meticulously clean! Top of the line kitchen. A must see. All for $425,000. EMERGENCIES SEEN 24 HOURS/DAY, 7 DAYS/WEEK WITH COMPASSIONATE CARE! New Fall & Winter Business Hours Starting November 5th! 40 ACRE RANCH, EASTERN U.P. BORDERS 5700 ACRES OF STATE LAND! Fenced pastures, partially wooded, underground watering system to pasture. Immaculate 5 bedroom, 3 bath home w/finished basement that has rec room, exercise room w/hot tub and shower. Formal dining room, breakfast nook, family room w/Harmon pellet stove. Main floor master bedroom with vaulted tongue and groove ceiling and master bathroom. Attached 2.5 car finished and heated garage. 30x48 barn w/underground water system, plus a 20x24 detached garage. Black top drive at end of dead end country road, assures plenty of privacy. 3 elevated hunting blinds, apple orchard, garden area, an abundance of wildlife. MUST see property. $309,500. Winter Horse Blankets Are Here! $1.00 OFF Socks & Gloves by... Waterproof Your Horse Blankets Ask us, we have what you need! The Last Fork You Will Ever Buy! Equine, Feline & Canine Vaccines Delivery Available! We load your vehicle for you! ONSTED: Established horse business on 20 ACRES, indoor and outdoor arenas, nice home, run-in sheds, pastures, paddocks, 28+ stalls, room for tack shop. Great location, paved road for any kind of horse business, trailer sales, training, etc. Private showings only - $449,900. GRAND BLANC: Beautiful country home, indoor/outdoor arenas, 10+ acres, 20+ stalls, heated barn, tack room, wash rack, fenced paddocks with run-in sheds. Great training facility. SOUTH LYON: 30 ACRES, main house, guest quarters, indoor arena, 15+ stalls, run-in sheds, equipment storage buildings, fenced paddocks. Offered with 30, 20 or 10 acres, call for pricing details. 10 acre vacant parcel can be split off to build a new home! BRIGHTON - Beautiful farmhouse custom built for authenticity while meeting the requirements of a modern and comfortable lifestyle. Horse facility has a 5 stall barn, outdoor riding arena, paddocks, pastures and is situated on 10.75 rolling acres filled with wildlife. Only minutes to downtown Brighton, Brighton Recreation Area and Mt. Brighton! Offered at $474,900. WANTED/NEEDED: Training facilities needed in Holly, Pinckney, Ann Arbor, Dexter, MI and surrounding areas w/indoor arena and 15+ stalls. Price will depend on facility. Sale or lease. HOBBY FARMS wanted in the South Lyon/Dexter/Ann Arbor areas. Must be 5+ acres with nice home and barn for horses. Indoor arena would be a plus. Price range from $200,000$650,000. Please call if you have one! Consult with a professional who is in the horse business and understands your needs. MICHIGAN INTERSCHOLASTIC HORSEMANSHIP ASSOCIATION MIHA is a non-profit organization that conducts interscholastic equestrian competitions for all interested students grades 6-12 in the state of Michigan. MIHA celebrated the 40th Annual State Championship meet at Midland County Fairgrounds October 9-12, 2014. 40 teams competed in showmanship, equitation over fences, western reining, gymkhana and equitation classes. Riders, coaches and parents enjoyed the great autumn weather while exhibiting great horsemanship and sportsmanship. Thank you to all of our members for a great 2014 season. We are looking forward to an even better 2015. 2005 quality brick home boasts over 4500 sq. ft., 3 bedrooms, 3.5 baths, efficiency guest apartment area, gourmet kitchen, fireplace, Geo thermal heat, central air, plus 2+ attached garage. Sitting on 12+ acres, outbuildings, fenced grazing and 2 arena areas. Property features a well maintained 3/4 acre pond with beach. This horse lovers paradise is set-up perfectly for horses with 7 stalls. 48x80 machinery building, paved lighted driveway and fenced patio/playground area. Contact: Amanda Hotchkiss (810) 614-9287 This beautiful almost 2600 square feet quad-level home is located on just over 10 acres. There are 3 bedrooms, including a huge master bedroom that opens up to a balcony overlooking the barn. Need closet space? This home has it! This home is all set up to bring your horse or other farm animals. The barn has two stalls with room for more, a hay room, cement aisle way, water and electricity. Barn opens up to a big grass pasture. WESTERN DRESSAGE PATTERN? Attend one of our clinics to find out! Sat., Nov. 15, Round Pen 4:30 Is My Horse Stubborn or Just Confused? Call us to learn about this new and exciting discipline! Dorothy is the first Michigan Trainer to complete the “Train The Trainers” clinic in Castle Rock, Colorado. CLINICS Available For ALL Breeds! Gaited Horses, Ponies & Mules Too! CALL FOR STALL AVAILABILITY! We are sponsored by Nutrena. Ask us about their feeds for horses! Fabulous Location and Setting - A RARE GEM! Just 2 miles to Grand Ledge and 8 miles to Lansing. Hartell Road is a paved road, and the long winding driveway to the home is also paved including the driveway to the barns. The heating system is natural gas, not propane! The highly desired Grand Ledge schools are within 5 minutes. The many stores, restaurants, banks, and churches in Grand Ledge and along West Saginaw from Grand Ledge to the Lansing Mall are within minutes. Only 6 miles to the W. Saginaw/I-96/I-69 interchange and an easy 14 miles to the MSU campus. Gorgeous Rambling Home built in 1997 with all the amenities to compliment this beautiful horse ranch. The Ranch style home has 4,470 sq. ft. of living area with 2,420 sq. ft. on the main level and an additional 2,050 sq. ft. in the exquisitely finished walkout lower level with many windows and a triple door wall. The rooms are huge and include a gourmet kitchen, spacious first floor laundry room, master bedroom that overlooks the horse paddocks, master bath with a whirlpool tub, doubles sinks and double shower, 3 ½ baths, cathedral ceilings, Andersen windows, plus many more features! Heated 3 Car Garage has extra depth and width, workbench setup with cabinets, bright overhead lighting, 2 floor drains, reinforced rafters for overhead lifting, extra electrical box, and a pull down stairway to extra storage above. Morton 36x48 Horse Barn is state of the art with an attached 30x45 barn for equipment storage and toys. Features include four 12x12 box stalls (room for fifth), rubber matting in stalls, Nelson heated waterers, swing out hay and grain feeders, three Dutch doors, and two barred stall windows with swing down latches. Tack room/office is finished, heated and plumbed for water. Wash area with floor drain in the center of the barn and includes a water hydrant. 12x36 hay loft is above and a saw dust bedding area below. Part of the surrounding acreage includes 5 separate fenced paddocks (approximately 5 ½ acres). The fencing is three board white vinyl with electric wire top rail. Ten matching white gates for easy movement of horses and equipment. Outdoor riding arena is 85x150 with matching vinyl fencing. The barn paddock has a 12x16 run-in with a water hydrant and electricity. The rest of the acreage in rear has lots of wildlife, and is a great area for riding. Offered at $539,000. Call Doug Pearl to view this amazing farm! We can customize any barn design! Call or stop in today for a quote on your next farm project. • 1-16’x11’ slide door • 1-3/0 walk-in door • Engineered Truss 4’ on ctr. • 1-20’x14’ split slide door • 1-3/0 walk-in door • Engineered Truss 4’ on ctr. • 1-20’x12’ 6” split slide door • 1-20’x14’ split slide door • 1-3/0 walk-in door • Engineered Truss 4’ on ctr. • 2-30’ x 16’ split slider doors • 1-36” walk door • Engineered Truss 4’ on ctr. Every Horse, Every Day! Every horse owner wants a healthy, glossy coat for their horse. You can improve your horse’s coat sheen and luster with CocoSoya®, a tasty source of unrefined oil and a natural source of Vitamin E.
HUGE SAVINGS... ON ALL IN-STOCK HORSE TRAILERS - WHILE THEY LAST! Stallion Service Sale Is Coming January 10, 2015! Trailer Maintenance & Safety Checks Too! We Service & Repair All Makes & Models of Trailers - Horse & RV! Vendors: 10x10 spaces $25 each. Tables available for rent $10 each or bring your own. Set-up begins at 7am Sunday morning, or large vendors may set-up Saturday night. www.sundownerofmi.com Over 22 Years In Business! 1st Saturday of each month starting at 6pm with tack, horses to follow Stop by our booths 304 & 306 or come and watch a demo! Learn how Tim builds a horse’s confidence and trust! Our goal is to help you build a calm, willing, confident partnership with your horse. We offer private & group clinics. Both you and your horse will benefit from our program. Call to book your clinic today! LYN MATHESON Lyn specializes in beginner Dressage lessons and the adult re-rider looking to get back into the saddle after time away, emphasizing safety and learning a correct foundation. Lesson horses available! Open House NOV. 16TH, 1PM-4PM Cavallo Equestrian Centre is undergoing a lot of changes, and in celebration we will be hosting an open house. There will be complimentary apple cider, donuts and hot coffee, so please bring out the whole family to see what we have been up to! ‘Tis the Season for Giving at Greenmayer Farms! • Enroll your horse in our training program and give him the edge for next show season! • Reserve your private or group lessons, Western Dressage or Natural Horsemanship and give yourself fun activities to practice over the winter! • Call us for a demonstration of the Bitless Bridle and give yourself and your horse the freedom and safety of bit-free riding! • Inquire about our up and coming partial horse lease program and give yourself the enjoyment of riding and leave the work to us! For more information on any of these opportunities or to inquire about a FREE one hour training evaluation! Now Offering Blanket Cleaning & Repair! TACK SALE Saturday, January 24, 2015 10:00 a.m.-3:00 p.m.
Space available: 6’x8’=$20 or 6’x16’=$30. Limited tables available upon request, first come first served. Set-up time: 8:00a.m. No dogs (except service dogs) allowed. ONE YR. ANNIVERSARY SALE DEC. 15-31! Come draw a present and see how much you can save - up to 40% Off! www.bridgewatertackandfeed.com Visit our website for monthly specials! TEAM SORTING PRACTICES Wednesday Nights 6pm-9pm & Every Saturday Night 6pm Sign-up ends at 5:45 for first draw, $20.00 per person. All riders under the age of 16 must wear ASTI certified helmets. Visit us online for announcements about special auctions and events! Brighton Twp. Private. Open floor plan, wood flooring. Kitchen w/lots of storage, beautiful cabinetry. Family room, natural fireplace. Living room w/french doors. Office. Fin. w/o basement. Barn for horses, 12x12 stalls, electric, water, tack room, small indoor arena. Well taken care of property. $450,000. Highland Twp. Easy access to all major freeways. Open floor plan, vaulted great room, country kitchen, 1st floor laundry, bedroom/ office, full bath. Walkout basement. New deck, pastures, pond. Barn with 6 matted stalls, INDOOR arena, observ. room, wash rack, tack closet, storage! Ride to State Land! $448,500. Saline Twp. Private custom brick home includes 1st floor master suite, great room w/fireplace, kitchen for the chef w/beautiful cabinetry and granite. Horse set-up, 12x12 matted stalls, tack room, wash rack, dressage arena. Hayfields. Minutes from Downtown Saline and Ann Arbor. $695,000. Rose Twp. 1879 sq. ft., great room w/vaulted ceilings, FP. Open dining w/door wall to deck, kitchen w/bay window. 1st floor master, master bath, jetted tub, half bath, laundry. 2 bedrooms, full bath upstairs. Part. fin. w/o basement. 45x35 horse barn, 4 stalls, tack room, water/power. Canal connects to 15+ acre lake. $359,900. Mundy Twp. Centrally located. Eight 12x10 stalls, tack room, hay storage. Automatic waterer in pasture, many paddocks, run-ins, 60x140 outdoor arena, trails. Ranch home, 3 beds, 2 baths, living and family room, appliances stay. Roof in great shape, basement. Low taxes. $189,900. Cohoctah Twp. Turn of the century farmhouse completely redone! Country kitchen w/oak cabinetry, Corrian countertops, 3 beds, poss. 4th, 2 full baths. 3 car garage w/heated workshop. Barn w/4 10'x12' matted stalls, water/electric. Producing hayfield. Dairy barn, excellent condition. $338,500. Gaines Twp. Custom built country estate w/large wrap around porch. Family room w/stone fireplace, all appliances stay, kitchen w/abundant storage, 4 oversized bedrooms include master w/bath suite, living and dining rooms. Newer roof, Andersen windows, NATURAL GAS. $235,800. Flushing Twp. Equestrian facility w/28 matted stalls, 60x144 indoor arena, tack rooms, grain room, wash rack, 8 paddocks w/3 board fencing. Automatic waterer, hayfield, half mile track. Apartment on grounds. Updated home roof/windows/paint. Good cond! Land contract terms. 30 mins. from MSU! $498,500. Horse Associations & Show Barns Please Note: When advertising with Saddle Up! Magazine, we will take the time to enter your event dates online and within the Show & Event Date section of the magazine. If you are not an advertiser, you must enter your event dates online at www.saddleupmag.com for them to be entered in the printed edition of the magazine. All event dates will be printed at least two months in advance. All event dates online may be entered as far in advance as you wish, and will remain there until the event has passed. Calendar Horse Shows, Expos, Clinics, Tack Sales, Store Sales... If It’s Equine Related, Enter It On Our Free Online Calendar! 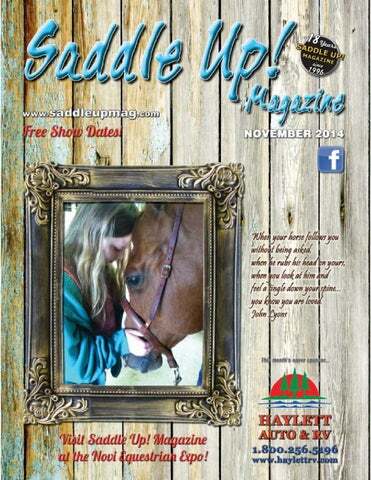 Once you enter your event online, we will approve it, post it and then add it to the printed edition of Saddle Up! Magazine. Event dates will be printed at least 2 months in advance, but remain online until the event date. ANY EQUINE RELATED EVENT IS WELCOME! Please take the time to enter your equine related event dates on our website at www.saddleupmag.com. Once you enter your event online, we will approve it, post it and then add it to our printed edition of Saddle Up! Magazine. Event dates will be printed in the magazine at least two months in advance. Enter your events online as far in advance as you wish! PLEASE NOTE: If you are an advertiser, Saddle Up! staff will make sure your events are entered on our website. If you are not an advertiser, your events must be entered by someone in your group, or by yourself for us to enter them in the printed edition of the magazine. Mail, fax or email us this coupon for One Free Classified Ad. Not valid without coupon, one per customer. $12.00 value! Click on the calendar tab! Horse Association & Club News HORSE ASSOCIATIONS, TRAIL RIDING CLUBS, ETC. Horse Associations, Clubs & Organizations! All associations/organizations that participate will receive a ½ page black & white ad in our special pull-out section that will be located in the center of Saddle Up! Magazine’s January 2015 issue. Utilize your ½ page ad for your membership form and other information. Each ad will be placed in alphabetical order and will be separated by state (MI & OH). All websites/emails in your ad will be “live” and will be directly linked to your website/email. Online presence will be one full page which includes ½ page association biography and ½ page membership form. *Inclu d As always, the staff at Saddle Up! Magazine will design your ad for no additional charge additi es ona Reserve your space by Dec. 15, 2014 • Your payment won’t be due until January 2015! ½ Pag l e Biogra p h ADDLE P! AGAZINE for you y r Email: saddleup@voyager.net • (810) 714-9000 • (810) 714-1465 fax Associat ion! First Cla Deliv ss e Avail ry able! 1 Year (12 Issues) Includes 1 Classified (up to 30 words) q q $15.00 3rd Class Delivery $30.00 First Class Delivery First class delivery takes up to 5 days, 3rd class can take up to 14 days q q 1 Year (12 Issues) Includes 12 Classifieds (1 per month, 30 words each) q $60.00 3rd Class Delivery q $75.00 First Class Delivery First class delivery takes up to 5 days, 3rd class can take up to 14 days q Visa q MC q Amx q Disc Exp. BOLD TEXT: First 4 Words Free! $1 per word (circle/underline add’l. words to bold). Classified ads and show/event dates must be received by the 14th of the month to be Please print, we will not be responsible for errors because of illegible handwriting. published in the following month’s issue. PHOTO CLASSIFIEDS: Add $10 to the cost of your classified. Good quality photos. Email photos .jpg or .tif (300 dpi). No refunds for poor photo quality. All photos returned. INCLUDE IN YOUR CLASSIFIED: Heading (Horse For Sale, Boarding, etc. 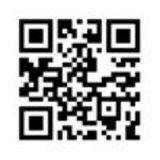 ), Description, Contact/Farm Name, City/County, Phone, and Email. We do not charge for heading, contact information, phone or email. Only count description text for ad cost. NEW ADVERTISERS: Must prepay for the first 3 months until credit is established. LATE PAYMENTS: All overdue balances of 30 days or more will incur a 1.5% late fee per month. Please reserve your ad in advance, limited space available. Email jpg, tif (300 dpi) or high quality PDF. Email jpg or tif (300 dpi preferred). Business, contact, address, ad size, phone, fax, email & payment. Spring Schooling Show March 2015! Hay & Straw 10am • Livestock 11am Check our website for weekly updates on auction prices! Now Accepting Members for 2015 Season! AUCTION FIRST SATURDAY OF EVERY MONTH Tack 6pm SHARP, Horses 8pm (following tack) New Time • Hot Food • Bring the whole family! Gobble Up Deals, Not Me! All Reg. Priced Justin Boots! All Reg. Priced Ariat Products! *Excludes saddles, Royal Wire, supplements, dewormers, consignments & special orders. Check Out Our Great Selection of WeatherBeeta Winter Blankets! Don’t Miss Black Friday Weekend at The Wire Horse! GORGEOUS COUNTRY ESTATE ON 11 ACRES IN SALINE, MI Extensive country estate home on 11 acres with upscale equestrian barn has it all! Set in the beautiful countryside just 3 minutes from town with handsome brick and cedar exterior. 3,192 sq. ft. home features huge two story great room with oak beamed Cathedral ceilings and fireplace, impresses and opens to full oak breakfast room and Merillat kitchen with peninsula. Formal dining room, study with oak wainscoting. First floor laundry room, 3/4 bath, screened back porch. Master suite has walk-in closet, master bath with dual sinks, garden tub and steam shower. 3 bedrooms, full bath, huge storage room upstairs. Daylight basement, 3.5 car attached garage. Deck overlooks property, gardens, farmland, and 5 acres of fenced, seeded grazing pasture. 36x60 two story barn features 2x6 walls, spacious rooms for equipment, tractors, boats or cars, workout room, tack room, 4 stalls (room for more), Nelson automatic waterers and floor mats. Home, garage and barn outfitted with Andersen windows, upgrades and extensive insulation! Up to 6 horses. Offered at $635,000. Option to purchase additional 11.18 acres. Proud to serve the Huron Valley area since 1950! We offer packages that can fit your needs, or We can quote whatever size building you need for your project! WE HAVE TWO LOCATIONS TO SERVE YOU! (248) 486-0925 Prompt, safe and experienced! Call today to schedule moving your horse, anywhere, anytime. We care about you and your horse. When you sign-up for a New Farm Account First Delivery is Free! Legend Land offers a 200 ft. indoor riding arena Call today for details! Legend Land Feed & Pet Supply At Legend Land, we care about your pets. We carry quality name brands at low prices. Come in and browse, or call us for delivery. Our prices are guaranteed! If you see a lower price anywhere, we will beat it! for all the riders on your list! Now is the time to get ready for next show season! Call Now For Our Winter Rate Special! Rides and drives, call or email for video and photos. Our website receives almost 2,500 individual visitors per day! Please note: we don’t count clicks, we count individual computers logging on to our site. This gives us a more accurate representation of how many people view our site daily. OPEN HORSE SHOW ALL BREEDS, ALL SKILL LEVELS Costume Contest, Stall Decorating Contest, English & Western Classes, plus Bridleless Competition. 9 Divisions for High Point Awards, Overall Champion Awards, and Bridleless Battle Awards. Truly An All Breed Event! We have had nearly every popular North American Breed represented at the Holiday ShoDown with Thousands of Dollars in Awards & Give-A-Ways! Ribbons 1st-8th place, Trivia Prizes, Door Prizes and More! Need to find just the right gift for the Horse Lover on your Christmas shopping list? at the West Michigan Winter Horsefest Check out our Facebook page for gift ideas and specials! AXIOM Winter Turnout Blankets Feature: • Super tough Ripstop 1800 Denier ballistic nylon. • 100% waterproof and fully breathable, full satin lining. • Heavyweight 300GM fiber fill. • Twin chest straps, double cross over surcingles, shoulder gussets without restriction on movement, twin neck straps for Combo. • Removable leg straps with solid clips, reflective strips for added safety, large tent tail flap. • The lowest price on the market! The Estate Home This prestigious estate home consists of over 7,800 sq. ft. of gross living area, 5 oversized bedrooms, 4 baths having the master suite include both a walk in shower and sunken style bathtub which allows the total relaxation that this home generates. The large gourmet kitchen is tied to the dining rooms for both ease in serving and design.There is a spacious fully heated attached 3 car garage that supports an upper level gym which includes a private fully equipped massage room.The home features geothermal heating and cooling, has meticulously hand-picked white cedar walls with cathedral ceilings that extend down through split stone fireplaces. The large windows provide a view to the manicured fully stocked fish pond that also offers a view directly to the horse pastures that surrounds the comfort of this estate. The property also includes a separate detached fully heated garage with an abundance of both upper and lower storage space. The Horse Farm The discriminating horse breeder will certainly appreciate the over 12,000 Sq. Ft. of indoor riding arena space that provides 6 stalls for immediate use with room for expansion. An upper level hay loft provides ease for storage and for access to the horse pasture. The riding arena is equipped with a tack room and provides a spectator viewing room. The Property This property is located within minutes of Northern Michigan's premier destinations, is nestled around 10 acres of private land that abuts over 9,000 acres of State private land known as the North Country National Scenic Trail which stretches from New York through Pennsylvania and Ohio and into Michigan through the lower and upper peninsula to Wisconsin and Minnesota and ending in the Dakotas. Offering New English & Western Tack at affordable prices! We also carry used Billy Cook, Circle Y & Hereford Saddles in very good condition. Complete with lovely updated 3 bedroom home and attached 3 car garage. Horse barn has 4 stalls, tack room, wash rack and hay storage. Second barn attached for horse trailer, motor home, and tractors. Nelson waterers, electric and Electro Braid fencing around pastures, and outdoor arena. Truly a farm and home to be proud of! Hartland School system, Livingston County, MI. Turn key ready, immediate possession. LL TRANSPORTATION Specializing in Horse Transportation Fast, Friendly, Experienced and Affordable We’ve been handling and transporting horses for over 20 years! 2 H straight load, 7’6” tall, dressing room, rear ramp, insulated walls horse area. 7’7” tall, side & rear ramp, dressing room, more! 24’ stock trailer, 7’ tall, 6’9” wide, 2 center gates with sliders, heavy duty fenders. 2015 TRAILS WEST ADVENTURE MX 7' tall, 6'9" wide, dressing room, swing out saddle rack, 25 gal. water tank, and more! MORE LAKOTA TRAILERS COMING SOON! 2015 LAKOTA 8311 LQ 3 horse, full living quarters, sofa, shower, stool, A/C, awning. Too many options to list! The Vanderhydes are horse tradin’ in Sparta. We take almost anything in trade! HEAVY DUTY TRUCKS IN STOCK! MATCHING MICHIGAN BOARDERS with MICHIGAN FARMS ARE YOU LOOKING TO BOARD YOUR HORSE? The BoardMyHorseNow.com in-depth search feature is an “Industry First!” The search tool allows the boarder to search free of charge from a menu of options to find a farm that specifically meets their needs. ARE YOU A FARM LOOKING FOR BOARDERS? Our extensive and easy to use farm directory will allow you to be placed in front of potential boarders instantly! Choose from three different packages to fit your needs. SIGN-UP BY DECEMBER 15, 2014 AND SAVE! Black Friday Weekend Sales Event Ever! Win A $50 Gift Certificate! Enter by posting on our Facebook page that you saw our ad in Saddle Up! Posted Black Friday Sale Weekend! Gorgeous 18 acres includes 10 acres of trails, 36x48 horse barn, 24x24 combo hay barn and run-in shed, two pastures with board fence and Nelson automatic waterer. Home has refinished oak floors, new carpeting, fresh interior paint, 1st floor master bedroom with adjoining bath, newer furnace and water heater, radon mitigation system, water softener and amazing three sided wrap around covered porch. The incredible horse barn has 6 stalls (4 built, 2 framed), 12' high ceilings and main door (tall enough for hay wagon), 12' concrete aisles with cross ties and electrical outlets, 12x12 wash rack with cold and hot water. Beautiful tack room features insulated knotty pine paneling, water heater and sink, all saddle racks, bridle racks & shelves. More models available than shown, call today! 60 VACANT ACRES in North Oakland County! Milford Road, Highland Twp., Michigan - Beautiful Property There just aren’t many parcels like this left in the area. Unique with many potential uses. Perfect for an estate or horse facility, potential development, recreation or just a great investment. Located across from Highland Oaks County Park with equestrian trails. Approximately 25 wooded acres, and 35 that are open and rolling. Outdoor enthusiasts will love all the wildlife. If you look at it, you will not be disappointed! Offered at $749,000. Perfect for a New Equine Facility! (517) 283-2645 • 1-800-231-2329 • Fax (517) 283-2652 Average installed cost per foot of fence (labor & materials) All prices subject to change without notice.